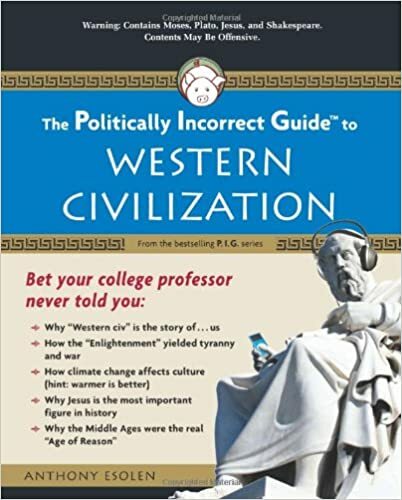 For more information on Native American tribes and other counter-intuitive facts of ancient and medieval history, see Anthony Esolen’s The Politically Incorrect Guide to Western Civilization. For the most part the Native American tribes lived peaceably believing that nature was sacred and was to be shared. However, the coming of the Europeans and the removal of their land led to conflict both between the different tribes and between the Indians and whites. By the end of the nineteenth century the Native American tribes had lost their fight to preserve their traditional way of life and those that had survived the conflicts were confined to reservations. The table below gives a summary of each of the main Native American tribes of the Plains. For more information on Native American tribes and other counter-intuitive facts of ancient and medieval history, see Anthony Esolen’s The Politically Incorrect Guide to Western Civilization © 2008. You can find it at Amazon or Barnes & Noble.